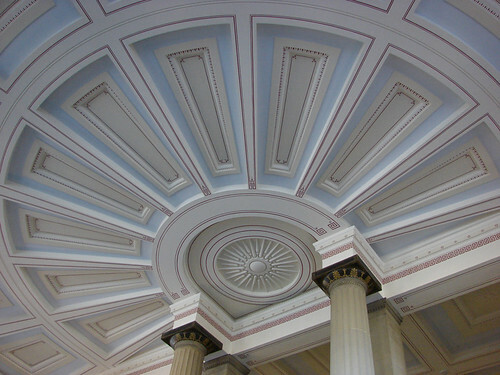 Experts are reverting to the original colour schemes used by the designers of the neoclassical hall in the 1850s. A 15-strong team is tackling the north entrance hall and small concert room, together with two grand staircases at the Lime Street landmark. When they are complete the venues will form a stunning backdrop for both public and private events. The work is part of the £5m second phase of restoration at the hall. Rob Chambers, of architects Purcell Miller Tritton, who is overseeing the project, said: "The walls of the entrance hall will be hand-painted with a granite effect in oil paints and then varnished over. It's painstaking work. It's going to take months. The whole project is due for completion in April or May." The bright colours which have adorned the entrance hall for many years are being replaced by muted pale blues, off-whites and biscuit tones which were used when the hall was built in 1854. I love St Georges Hall, I think its a magnificent looking building. Can you actually venture inside to have a look around, and what was/is it used for?! Starting to look a little worn again! I like the little Merseyrail entrance on the corner. The occasion will be the culmination of a £38m series of phased restorations starting in 1998 to bring St George's Hall back not only into public use, but on a scale never experienced before. 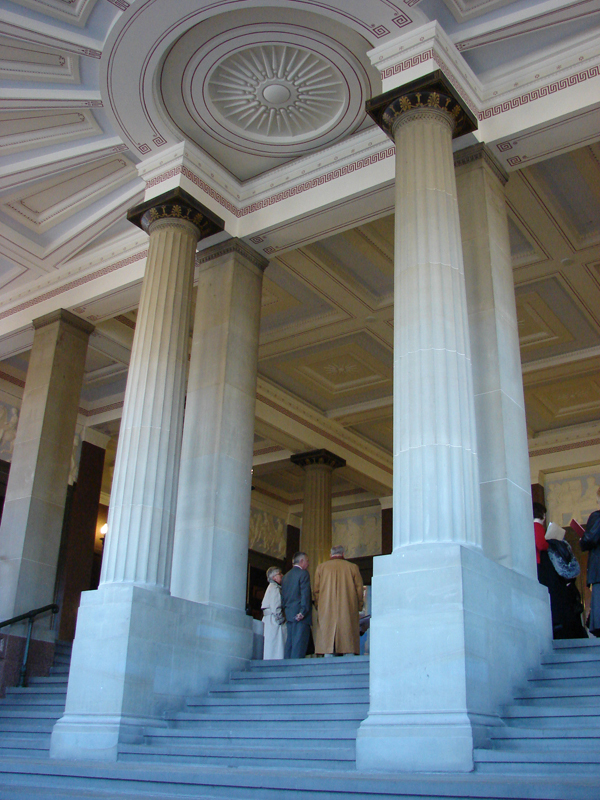 It will be a case of access all areas, or at least as many as possible, with the hall open to all visitors, rather than those attending functions or tours. "Talking to people around the city, I get the feeling they can't wait to get back into St George's Hall and see what has been done," says Matt Osmont, assistant project architect. "Not only that, but they'll be experiencing parts of the building that have never been open to the public before. 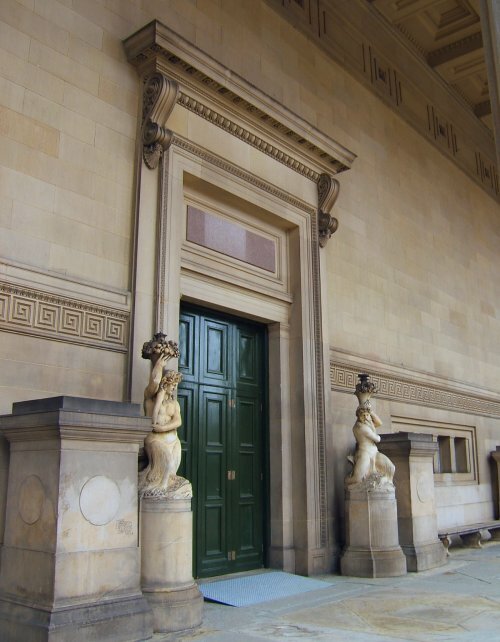 "This is the finest neo-classical building in Europe and the restoration finish has to be right. You cannot quibble about the quality. "Everyone adores working on this building because there is nothing like it. "We constantly have to remember that what we do should be still here in another 100 years' time, so fixtures and fittings have to be matched, while remaining clear what is new and what is not." I've read a few times recently that St George's Hall was threatened with demolition. I don't know where that statement originated, but it's not true. Perhaps it just makes better "copy" to say so. When the Law Courts moved from SGH to Derby Square, SGH was "mothballed", but there was never any suggestion of demolition. The Lyceum was threatened with demolition, and that very nearly happened, but Liverpool has always known it has something extra special as regards SGH. when i read things like this, it just makes me wonder....WHO IS IN CHARGE OF OUR CITY??????? 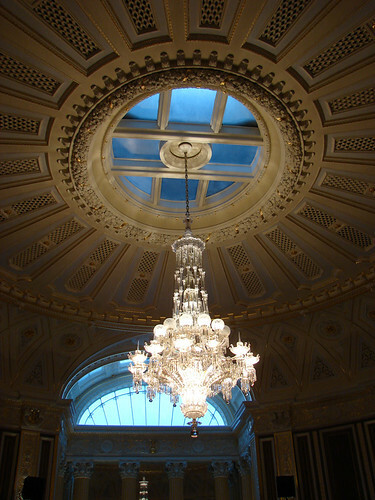 Had the pleasure of visiting St. George's Hall today - 25th Jan 2007. The place is beautiful. Apparently a member of The Royal Family will be officially re-opening it to the public soon. Oh! Mighty fine pictures Kev. Brilliant pics Kev. does this mean we can get in there soon then? Great pics, they have done a great job on the restoration. Last time I was in there it was at a Liverpool Uni panto ball in the late 50's, my mate got thrown out for climbing up and playing the organ, what an overpowering sound, drowned out the jazz band. I saw Steve Davis play Terry Griffiths in the Georges Hall. Fantastic pics, Kev! Never been inside. Would like to do so one day. 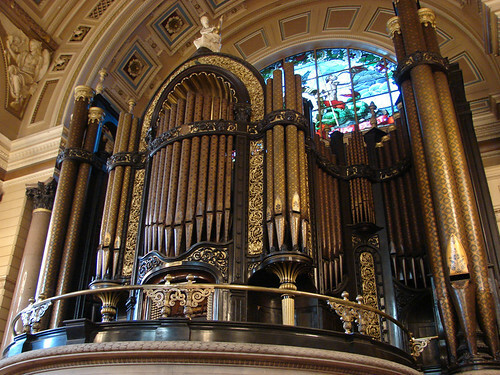 Thanks for the kind comments - the place blew me away totally, the size of the organ pipes, huge. The place is like a palace. The concert hall we were in played host to Charles D!ickens many times I believe. I've been in there loads of times over the years. it's been open to the public many times. I've also been on a tour of the former law courts, the cells in the basement, and I've seen behind the back of the organ - the pipes are massive and the biggest ones you can stand inside ! The gorgeous tiled floor is uncovered from time to time for display to the public. It's definately worth seeing. St Georges Hall is fantastic. I was in their during the Biennial and was blown away. The inside is just as OMG as the outside. Its an amazing building. can anyone tell me was the hall built the wrong way round? Just heard that Prince Charles will be opening St George's Hall on 23rd April! Mike Storey let that one slip a while ago , although he never mentioned names he did hint strongly. Just Been talking to My Lad 2 minutes ago about the Photo I've just put On. He has Just told me that in 94 he and a Mate were passing the Column and it was open so he came home and got my Maglite and they went up the Column. Seen another of his mates Below sand shouted him up..
Next thing theres about 15 of them up there..
Cant really have a go at him now can I when He's 27 ! !..Besides..I did it Myself about 5 Times..
Wouldn't go up there Now Though..Snappel would be made up up there. I have heard that Speke Hall is also on HRH's list of visits for that day. The grand re-opening of one of Europe’s finest civic buildings will be marked by the UK’s largest, outdoor sound and light show this year. Liverpool will celebrate the £23m restoration of its neo-classical masterpiece - St George’s Hall – by hosting twice-nightly Son et Lumiere displays recounting the city’s past 800 years. Devised by the Liverpool Culture Company and Ross Ashton, who lit up Buckingham Palace for the Queen’s Jubilee and 80th birthday, the 30-minute showcase will project on to the rear of the Grade I-listed building. Audiences can see it from a special 500-seater, tiered grandstand in St John’s Gardens. Tickets for the unique audio-visual spectacle, which runs from April 23-29, go on sale today from 3pm, Thursday, April 5 (ticket details see Notes to Editors). The rarely seen, 30,000-piece hand-crafted Minton tiled floor in the Great Hall will be on display for the first time this century. Last unveiled in 1997, it will be on show from 10am to 8.30pm every day until Sunday, April 29. 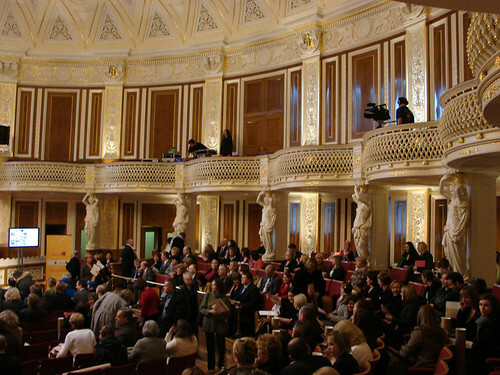 A series of concerts by Liverpool musicians, such as the 2006 BBC Young Musician and Composer of the Year Mark Simpson, in St George’s Concert Room. A new work of art interpreting the city's coat of arms by the acclaimed Singh Twins. A new sculpture of St George slaying the dragon with a Liver Bird rising as a phoenix. 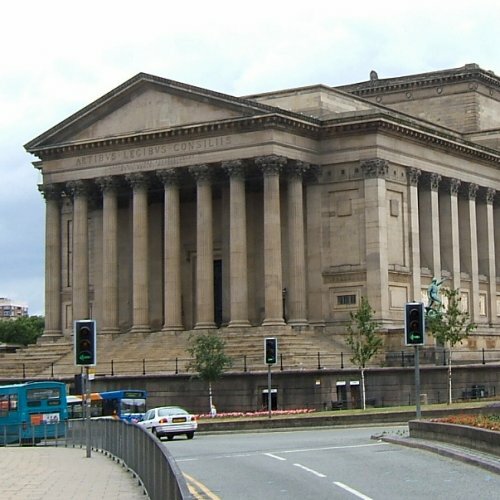 First opened in 1854, St George’s Hall was the result of two design competitions for a civic and court venue, both won by architect Harvey Lonsdale Elmes for his 'Acropolis-like' vision. Queen Victoria described it as ‘worthy of ancient Athens’. 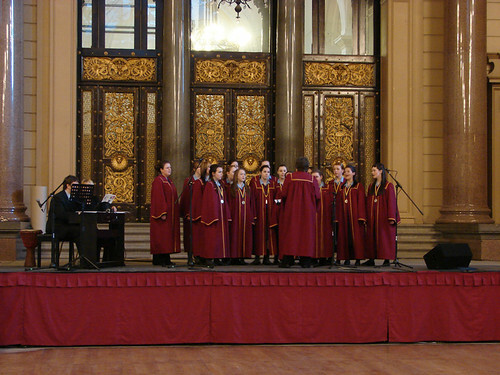 Fitted with the world’s first modern-air conditioning system and largest piped organ at the time, it hosted famous cultural events such as Charles Dickens’ world premiere reading of The Christmas Carol. The courts closed in 1984 and only the Great Hall has been in use since. The building, however, has become a symbol for the city, as a focal point for everything from remembrance services to football cup parades and rallies to vigils - most notably the death of John Lennon in 1980. New Heritage Centre with innovative public tours called Truth and Justice; Power and Glory. New street level access at South Entrance from St John's Lane. Upgraded courts, Judge's robing room and prison cells - on show for the first time. New community exhibition centre – available for hire to societies and groups. St George’s Concert Room restored to original finishes and new 450-seat capacity. The Heritage Centre tours will be self-guided, powered by hand-held digital devices, and tell the story of the building, its role as a cultural venue and as a Crown Court – having held famous trials such as the Cameo murder case, ‘the man the from the Pru’ and Florence Maybrick, wife of chief Jack the Ripper suspect James Maybrick. The Liverpool 800 Son et Lumiere will be at 8.30pm and 9.30pm from Monday to Sunday, April 23-29. Tickets - £1.50 for concessions, £3.00 for adults. A family ticket for two adults and two u-12s at £7. On sale from 3pm, Thursday 5th April at the 08 Place, Whitechapel or by calling 0151 233 2008. A box office will be on site from 6pm each evening. It is recommended that tickets are bought in advance to avoid disappointment. Visualisations of the Liverpool 800 Son et Lumiere on St George's Hall can be e-mailed for free on request. 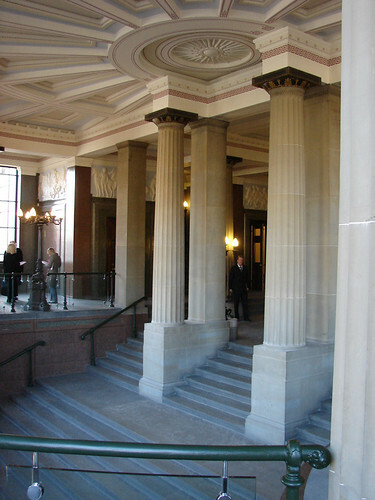 The restoration of St George's Hall was led by the architects Purcell, Miller and Tritton. The project was funded by the Heritage Lottery Fund, European Regional Development Fund, The Trustees of St George's Hall and Liverpool City Council. 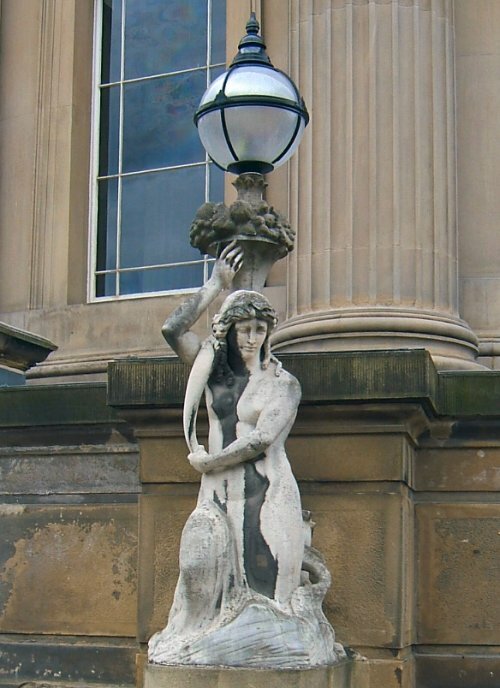 As well as major external and internal repairs to the stonework, plumbing and electrics the restoration of St George’s Hall included intricate hand painted decorative and plaster work. 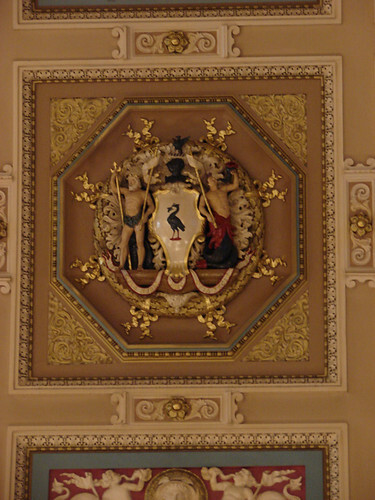 For example a total of 300m sq of gold leaf was used, the equivalent of two tennis courts if laid flat. Free images depicting the restoration can be e-mailed for free on request.